This bag is just the right size for my 7 year old daughter to use to take her things back and forth to appointments we might have. We usually have what is called the fun bag. This is a bag that is filled with busy item such as coloring book, coloring pencils, stickers, little games, paper, and little toys. It is taken along to keep the children occupied while we are out and about on errands. I love that this bag can be worn on either the left of right side by just changing where the strap is snapped to. There is a spot for a music device and headphones which is really nice so that their device is inside the bag and not out where it can be lost. You can find this sling backpack on Amazon. 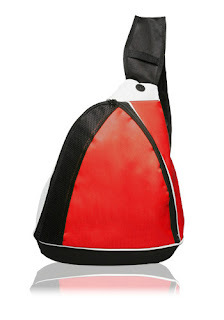 Send your kiddo off to school with this Rugged Sling Backpack made of Durable 600D Polyester. These Two Tone Backpacks feature a Main Zippered Compartment and an additional Inside Pocket with Velcro closure. The Shoulder Sling is Padded and Adjustable and is made for either Right or Left Handed kids.